I’m not convinced that Cabell City was ever a “real” city in the traditional sense, at least, it never had a post office that I can find information about. It is pretty obvious that at a minimum it was a fairly decent sized gold mining camp though. Oregon Geographic Names says that Fred E. and John B. Cabell located the La Bellevue Mine nearby. Mining cars most likely came from the mine to the mill here to process the stone and extract gold. If you look the way of the arrow, you’ll see this bridge. 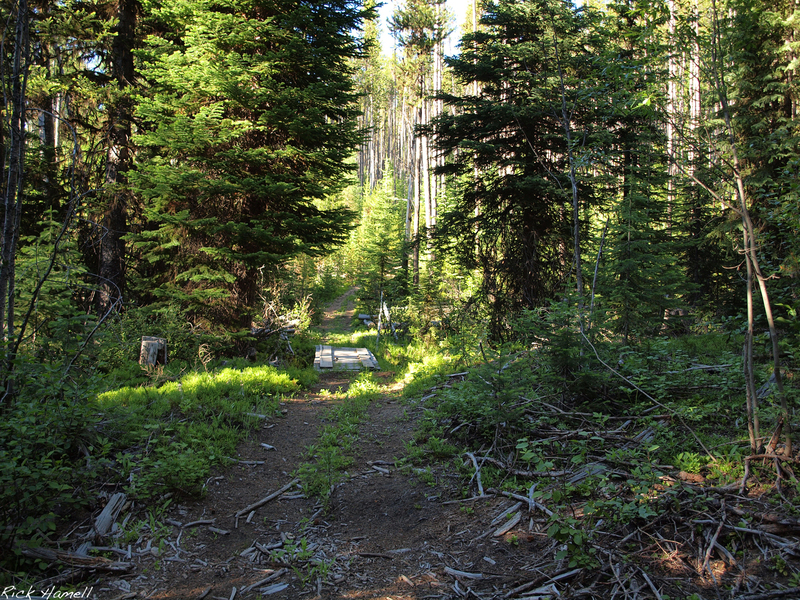 Following the path takes you up to a small fenced off (by the U.S. Forest Service,) graveyard. 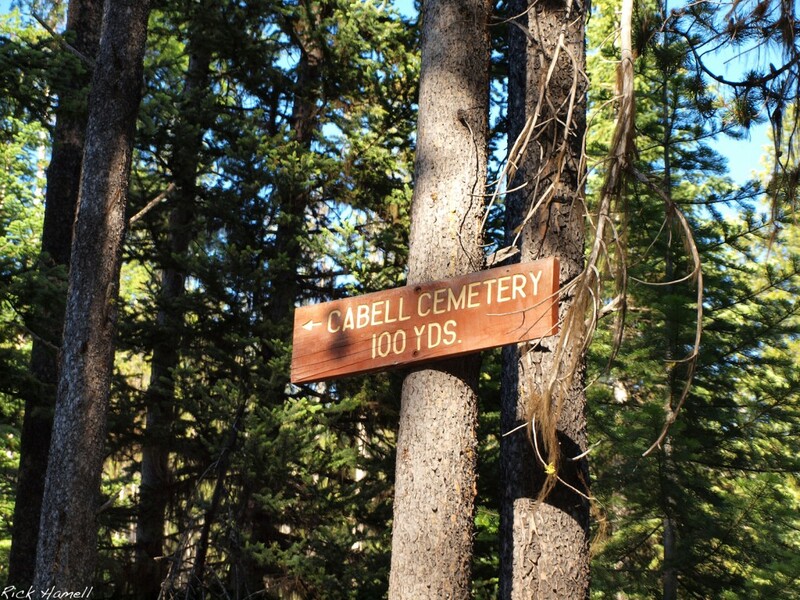 Only one grave marker remains, but according to the USFS, Fred Cabell, his wife Johanna, and their eight year old daughter are all buried here. Only Johanna’s grave seems to still be marked with a wooden marker which is nearly impossible to read. Following the original road, someone’s trailer is parked on the right hand side. No one was at home when I came through. A few yards past that is the main part of the town. Electricity still seems to be in the area, and several of the buildings were wired, including a couple of sheds. According to Brian894x4.com there are several buildings in the area. I was only able to find two small sheds, the ore processing building and what looks like a house. I didn’t have a lot of time to really explore as it wasn’t too long until dark, but there were several tantalizing trails in the area obviously created by 4×4 ATV vehicles. Perhaps one or two of them would have led off to another building or two. 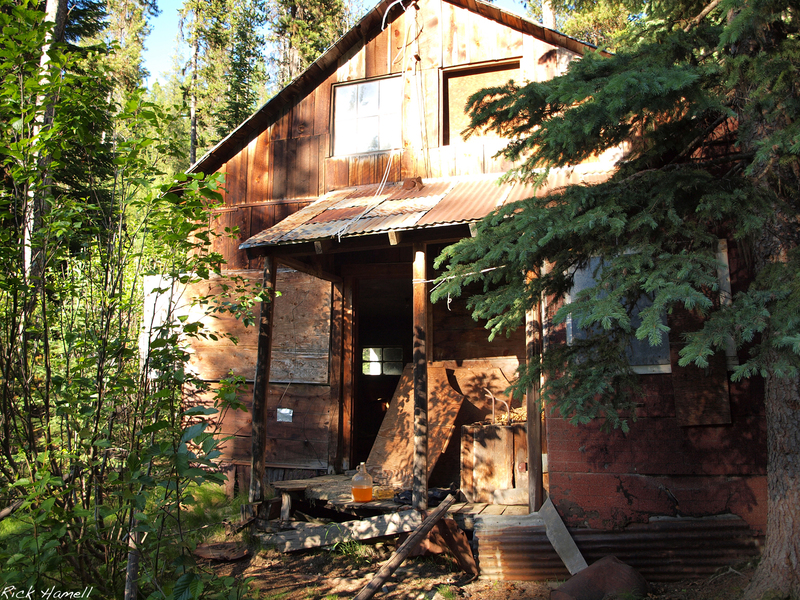 I remember spending my Summers in that cabin, working the mine, running the mill and processing the concentrates. Great memories. Sad to see how looters have destroyed the place since. My young son and I found this place with the help of a forest service ranger. It was about 2008. We left it just as we found it. I heard that it wasn’t hold that was being mined there but some kind of quartzite. Hello Chris! Thank you for stopping by. Technically the mine is pulling up quartz. But they then crush it to a fine powder and separate the gold flakes out. In theory one could make pretty good money finding old mine tailing piles of quartz and then processing it. I visited Cabell City in 1985. At that time there were remnants of the John B. Cabell family home about a half a mile up the road. Part of the old La Bellevue Mine stamp mill was still standing. My father said the mine was established circa 1875 by his father John B. and uncle, Fred Cabell. I have a picture of my father as a child with my grandfather and grandmother in front of the cabin. Hello Mr. Cabell… I have long been curious about the correct pronunciation of the name, Cabell. I think you would be the perfect person to set the record straight. Is it pronounced ‘a’ like the letter ‘A’, Ca-bell, or perhaps ‘ah’ like ‘say ah’ at the doctors office, Cah-bell. I have also heard it pronounced ‘oh’, like ‘oh no’, Coh-ble. As a teenager in the late 70’s, my parents leased a small cabin in the area from the forest service. It was a log cabin about 1/2 mile from the mine building, but it was downstream on Little Onion Creek. Do you know any of the history of that small cabin. I remember a couple, Rose & Harley Haskins. I believe they were caretakers of some sort. My father lived with his parents in a log cabin on the same hillside as the La Bellevue mine stamp mill, above a creek. When we visited the area in the mid 80s, it was in ruin, as was the stamp mill. I don’t know if it could possibly be the cabin you stayed in in the 70s or not. My husband and I just purchased the claim rights for Cabell City Placer Mine. We would like to inquire as to who had put the new white crosses in the cemetery? Anyone know? Unfortunately it looks like a fire had come through there, but rest assured the cemetery was not touched, as was not most of the property. Unfortunately again, it looks like people have abused this historical site. 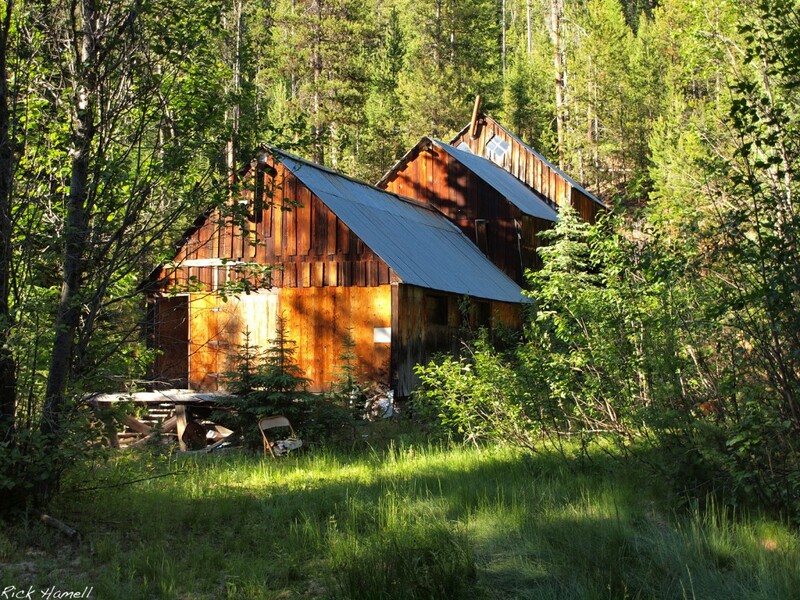 We purchased the mineral rights to help preserve a part of Oregon’s history. Also, we would like to reach out and ask if anyone knows the name of the daughter? We would like to put a family headstone to show our respect and God blessings of the hard working family. Any help would be much appreciated. We found Cabell City this last Sept. Enjoyed walking around and taking pictures, left it the way we found it. We enjoy the history of these old sites and respect them too much to take or damage them. We were told that the Forrest Service put up the white crosses. I am the great-great-grandaughter of John Cabell. He was the co-founder of Cabell city and owner of several mines in the area, including the La Bellevue Mine, along with his brother, Fred Cabell. It is Fred’s wife, Joanna, whose headstone is still readable in the Cabell City graveyard. Sadly, the only elder member of this branch of the family still living is my 90 year old father, Rodolph (Rudy) Cabell, Jr. Unfortunately, he was never told the name of Fred and Joanna’s daughter, who died at the age of six.